Style and comfort - get ready for the best of both worlds in a desk chair. Mesh back and leather upholstery on the cushion are just two reasons why the Raynor Ergohuman Chair - Mesh Chair with Leather Seat model LEM6ERGLO is so well-loved in offices everywhere. This ergo-friendly chair is supremely comfortable, comes without a headrest, and is equipped with a single-paddle adjustment mechanism, letting you set to your height preferences easily. It's the simple chair that's sure to make a huge difference in your work style instantly. 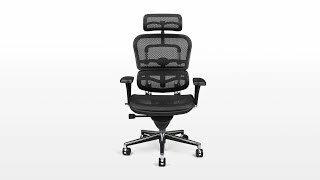 Partake in the best in office seating with a chair that boasts supreme lumbar support and improved airflow to the back. All of these features come together in the Raynor Ergohuman Mesh Chair with Leather Seat to form the ideal seating solution for you, letting your mind wander back to more important things, like your work. $695.00 List Price: $1,303.00* The list price is the same as the MSRP (Manufacturer's Suggested Retail Price). It may not necessarily be the price at which the product is sold.